Pakistani rupee has sharply declined to 109.50 rupees to a US dollar, a loss of nearly 10% of its value in just a few months since Mr. Nawaz Sharif was sworn in as Prime Minister in June, 2013. At the same time, the foreign exchange reserves have plunged to $3.463 billion, a 12-year low since November 2001 when country had foreign reserves of $3.5 billion. The drop in rupee and foreign exchange reserves is happening in spite of the fact that remittances from overseas Pakistanis are setting new record highs and IMF bailout funds are also being disbursed. Overseas Pakistanis have sent home over $55 billion since 2008-9. Last fiscal year alone, expatriates remitted about $14 billion. Additional $ 5.3 billion in remittances have flowed in the first four months (July-October) of the current fiscal year 2013-14, a increase of 6.27 percent over the same period last year. Net foreign direct investment (FDI) has surged 13.3 percent to $424.9 million in the first four months (July- October) of the fiscal year 2013-14 versus $375.1 million received in the same period of last fiscal year, according to the State Bank of Pakistan as reported in the media. Pakistan has received $550 million from $6.6 billion bailout package agreed in September this year. Economist Sayem Ali was quoted as saying by Pakistani newspaper Express Tribune that sharp decline in foreign exchange reserves resulted from large oil import payments and external debt repayments. “Aggressive monetary tightening, higher import duties and cash margins on imports would have eased the pressure on foreign exchange reserves. However, the government has so far not shown any urgency to arrest the decline in reserves,” he said. Economic mismanagement by Nawaz Sharif's economic team brings back memories of the lost decade of 1990s when economic growth plummeted to between 3% and 4%, poverty rose to 33%, inflation was in double digits and the foreign debt mounted to nearly the entire GDP of Pakistan as the governments of Benazir Bhutto (PPP) and Nawaz Sharif (PML) played musical chairs. Before Sharif was ousted in 1999, the two parties had presided over a decade of corruption and mismanagement. In 1999 Pakistan’s total public debt as percentage of GDP was the highest in South Asia – 99.3 percent of its GDP and 629 percent of its revenue receipts, compared to Sri Lanka (91.1% & 528.3% respectively in 1998) and India (47.2% & 384.9% respectively in 1998). 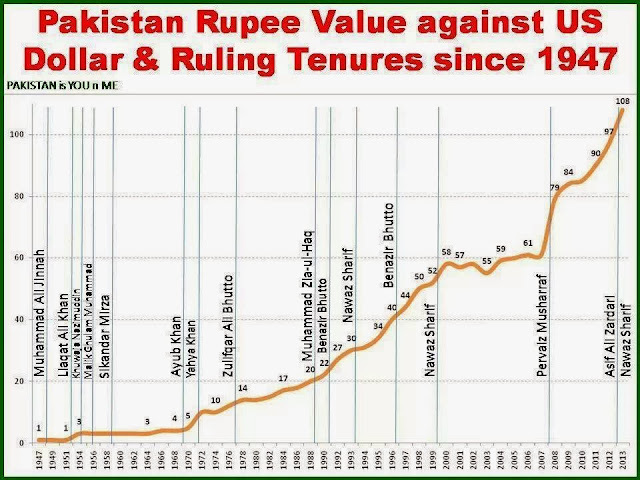 Internal Debt of Pakistan in 1999 was 45.6 per cent of GDP and 289.1 per cent of its revenue receipts, as compared to Sri Lanka (45.7% and 264.8% respectively in 1998) and India (44.0% and 358.4% respectively in 1998). After a relatively peaceful but economically stagnant decade of the 1990s, the year 1999 brought a bloodless coup led by General Pervez Musharraf, ushering in an era of accelerated economic growth that led to more than doubling of the national GDP, and dramatic expansion in Pakistan's urban middle class. Pakistan's savings rate reached historic high of 17.6% of GDP in 2004 and remained above 15% during Musharraf years. It has now plummeted to a new low of just 4.36%. The best one can hope for is that Nawaz Sharif and his finance minister Ishaq Dar have learned from their past mistakes and they will try and do better this time around. I expect it'll be a lot tougher now because of other major issues such as terrorism and energy which also require a lot more attention. Pakistani Economy under Nawaz Sharif; PTI Dharna; Indian Elections from WBT TV on Vimeo. Does Nawaz Sharif Have a Counter-terrorism Strategy? Maybe due to money spent on oil etc. As long as the present leaders are busy looting the meagre resources of the country, I do not see any improvement, all their attention is rivetted to amassing as much wealth as they can, they do not have time to do anything good for the country and its poor masses. 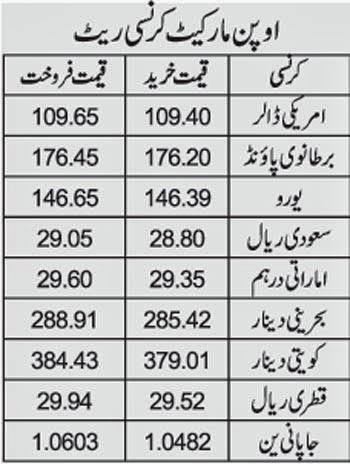 Your statistics show that Mussharaf was many times superior to all these polititions who are taking turns in looting whatever little is left. God only can help Pakistan by some how or the other getting rid of these corrupt and shameless looters of the countries' wealth and giving a chance to somebody like Imran to run the country. So now gdp will shrink by 10% or more?? Salim: "So now gdp will shrink by 10% or more?? " No, Pakistan economy has never shrunk in its entire history nor is it likely to. It's still growing at about 3-4% which is very slow given the fact that it's still a developing country with rising population capable of increasing GDP at 6-7% annual rate. "Sharp fall in Indian currency against the US dollar and slower economic growth have caused India's GDP for Fiscal Year 2012-13 to shrink in US $ terms to $1.84 trillion from $1.87 trillion a year earlier. The Indian rupee has plummeted from 47.80 in 2012 to 54.30 to a US dollar in 2013, according to Business Standard. Since this report was published in Business Standard newspaper, Indian rupee has declined further against the US dollar to Rs. 59.52 today. At this exchange rate, India's GDP is down to $1.68 trillion, about $200 billion less than it was in Fiscal 2011-12. " Now that PKR has plummeted by 10%, Salim has a point using your reasoning as in India's case. Iqbal: "Now that PKR has plummeted by 10%, Salim has a point using your reasoning as in India's case." Indian rupee was and is down a lot more than 10% and greater than the current inflation rate to compensate for drop in nominal GDP due to exchange rate. ISLAMABAD: Pakistan's annual inflation rate rose to 10.90 per cent in November from 9.08 per cent in October, the Pakistan Bureau of Statistics said on Monday. On a month-on-month basis, prices rose 1.27 per cent in November. For October, the monthly pace was 1.97 per cent. The average annual inflation rate for July through November was 8.84 per cent. ^^RH: "Here's a Dawn report on Pakistan's rising prices..."
Forget about rising prices, have you SEEN the latest reports on the TOTAL COLLAPSE of our savings rate? With its foreign currency reserves hitting the dangerously low level of $3 billion, Pakistan has requested the United States to expedite the process of releasing about $900 million on account of services that Islamabad has rendered in global fight against terrorism. The request to disburse dues on account of the Coalition Support Fund (CSF) was made by Finance Minister Ishaq Dar on Thursday during a meeting with Washington’s Ambassador to Islamabad Richard Olson. He urged the US to release the outstanding dues in order to avoid the looming threat of default on international payments. “Early reimbursements of dues on account of Coalition Support Fund… will help Pakistan in improving its present foreign exchange reserves position,” Dar was quoted as saying in an official handout, issued by the Ministry of Finance. But while the urgency to secure the release of CSF dues builds up on one hand, Dar’s request could not come at a more inopportune moment. As the minister implored the US envoy to fast track the release of the fund behind the closed doors of Q Block, the workers, office bearers and parliamentarians of Pakistan Tehreek-e-Insaf were staging protests barely a few hundred yards away, outside the Parliament House, demanding the government stop the passage of Nato supplies through the country in retaliation to continuous drone strikes in the tribal areas. The US Ambassador, meanwhile, remained non-committal about the timing of the release. 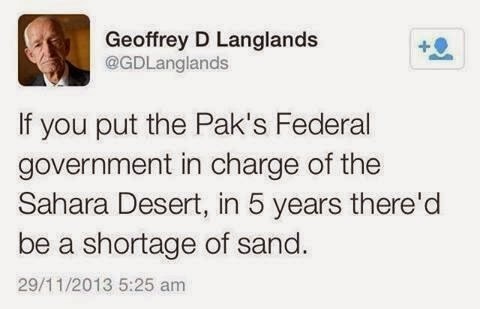 An official handout stated that Olson assured the Finance Minister that he would convey Pakistan’s position to the US government. According to the State Bank of Pakistan, the country’s foreign reserves have plunged to $3.05 billion as of November 29 – a sum sufficient to back an import bill of just three weeks. The reserves held by commercial banks stood at $5.19 billion, said the SBP. The outflows were not matching with the inflows due to heavy repayments to the IMF and other international lenders, and delays in taking certain policy decisions which the World Bank and the Asian Development Bank have demanded be implemented before release of loans. The IMF has so far given only $547 million while another tranche of roughly the same amount is expected to be approved by the lender’s executive board before the end of this month. For the current financial year, Pakistan has budgeted $1.2 billion on account of CSF. However, the US has so far disbursed only $322 million. Around $900 million remain outstanding. Pakistan hopes to receive at least $300 million more in coming weeks. It is not yet clear whether the Obama Administration has notified the Congress about releasing another tranche to Pakistan on account of CSF. The administration is required to give a 15-day notification before it can release the amount. Christmas and New Year holidays in the US will start from December 23, which may adversely affect Pakistan’s bid for early disbursements. Lost decade? Unless we have another military coup, I fear that this "democracy" of ours will lead to a LOST GENERATION. Sharif may be marginally better than Zardari, but I doubt he is capable of tackling the serious macroeconomic and political problems we face today. Only an unelected (non-populist) military government (dictatorship) can have the strength needed to do that. Pakistan's future now lies in the hands of the Army. Do you disagree? Do you think democracy will work for Pakistan? Pakistan’s provinces, where much of the welfare and infrastructure lies, are all running balanced budgets as required by the constitution. The federal government has obligations to smaller regions that it administers, such as the federally administered tribal areas (Fata), Gilgit-Baltistan and Azad Jammu and Kashmir, but these don’t even account for 1% of GDP. The much maligned defence accounts for 3% of GDP, which may not be as large as it seems given that the country is at the forefront of the war on terror. The running of the federal government only accounts for about 1.5% of GDP. Debt service obligations account for the largest chunk about 4% of GDP. All in all, the federal government does not appear to be a spendthrift locked up in colossal administrative and defense expenditures that cannot be reversed. Where then is the problem? The federal deficit borders on about 8 to 9% of GDP. Our revenue is only about 9% of GDP. Adding up the above mentioned items, our expenditure commitments are only about 9.5% of GDP. Our deficit should then be about 1% of GDP at most, rounding out errors. Well the government wants a public investment programme, also known as the Public Sector Development Programme (PSDP), which accounts for about 3% of GDP. Can this be contained? Used more wisely? Absolutely. For years the PSDP has been used as a slush fund by all political factions, politicians, dictators, defence establishment, and the bureaucracy. There is a rush for development without purpose. Indeed, much of it is brick and mortar with a low rate of return and often times developed for non-economic ends. But the other major drain the budget is the public sector enterprises, especially in the energy sector. Over the years, the PSEs have been enmeshed in administrative bureaucracy and often used for their own slush funds and repositories of perks. The DMG gets positions in boards and often even as executive heads of the PSEs. The rules of business make the secretary the principal accounting officer (PAO) of the PSE. This status allows the PAO to raid the PSE for vehicles and real estate. For some reason, despite agriculture being a provincial subject now, the federal government for its own political needs wishes to intervene in agricultural markets. It subsidises fertiliser and chooses to set the procurement price with a commitment to buy wheat. While the fiscal cost of these commodity operations is only about 0.5% of GDP, they do involve large and expensive government guarantees (almost 2% of GDP worth of bank credit is used). In addition, they distort the agricultural market. Cleaning out this operation i.e. rescinding government involvement is expected to increase GDP growth by about 0.5% annually. Summing up these figures we can see that our fiscal deficit of about 7-8% comes from PSE losses, PSDP and commodity operations. Dictatorship may is better in short term, but democrazy can only ensure lasting peace. The problem is that in dictatorship one person has to ASSUME what is good for the people. Moreover there would be no checks and balances in a dictatorship. I am impressed by what imran khan had to say in a press meet yesterday. Simple solutions do exist for complicated problems. Just that you need to look at the problem without the unwanted baggage of ego, outcomes, etc. Anon: "Dictatorship may is better in short term, but democrazy can only ensure lasting peace." Democracies wage wars just as often as dictatorship....sometimes more often. There are no examples in Asia of democracy bringing prosperity. To the contrary, all Asian Tigers became prosperous under dictators before becoming democracies. The contrast between India and China offers a stark difference between the results delivered by one-party dictatorship in Chima and multi-party democracy in India. "Many Asians say that the Asian Way is first to open your economy, to bring prosperity to your country, and then, only after that, to open up your political system. They say thar the reason the Russians failed is that did it the other way around. Russia opened up its political system in the absence of a sound economy, everybody bitched and complained, and chaos inevitably ensued. As an example of the Asian path to political openness, they point to South Korea and Taiwan, both of which were once vicious dictatorships supported by the United States. Japan was at one time a one-party state supported by the US military. Singapore achieved its current status under one-party, authoritarian rule. All these countries have since become more prosperous and more open. Palto,in The Republic, says that the way societies evolve is by going from dictatorship to oligarchy to democracy to chaos and back to dictatorship. It has a certain logic, and Plato was a very smart guy. I do not know if the Asians ever read The Republic, but the Asian way seems to suggest that Plato knew whereof he spoke." Not only is the Asian model different from that of the Soviets, it stands China in marked contrast to those thirty-year dictatorships previously mentioned. Chinese leaders have put a high premium upon changing the country's economy, presumably to seek prosperity for the 1.3 people who live there." "And yet,in 1947, when it achieved independence, India was one of the more successful countries in the world, a democratic country. But despite democracy, or maybe because of it, India has never lived up to its potential. China was a shambles as recently as 1980. India was far ahead of it. Bt since then China has left India, literally in the dust....As China rises, India continues to decline relatively. Its dent-to-GDP ratio is now 90 percent, making a strong growth rate virtually impossible." Jim Rogers: "And yet, in 1947, when it achieved independence, India was one of the more successful countries in the world, a democratic country." IF this is true of India, THEN it is also true of Pakistan. Would you describe the Pakistan of 1947 as "one of the more successful countries in the world"? Just check the China, India and Pakistan boxes on the right to see their positions in 1950 and then play the movie to see how these three countries have evolved since then. ALSO Note NIGERIA & KENYA in that graph from 1950 to current. Riaz Haq. your view that in asia only dictatorship will work is totally flawed. Your example of china is not correct. As i have said it is a short term phenomenon. It is just like the japan of 1990 or the other asian tigers who were fuelled by US growth. Dictators can run factories. They cant rule societies nor can they support a civilisation. You are correct to the extent that dictator ship may work for pakistan at this moment, because terrorist dont understand democrazy, but understand that you are underestimating the power of democrazy at your own peril. PS: Have you lived under dictatorships. You cant be selfish and live in US and condemn all of us who live in asia into dictatorships. Anon:" As i have said it is a short term phenomenon." Th experience of Asian Tigers shows that 20 or 30 year long "short-term" is good enough to lift the vast majority of people out of poverty and pave the way for responsive democracy with good governance. It's certainly preferable to the continued high levels of poverty and huger that people in Indian "democracy" are suffering for the last 66 years. Mr.Haq, China today suffers from air pollution, contaminated food etc. Please wait for another 2 years till they suffer from water pollution and soil pollution. What benefit is is it to give contaminated food or unclean air to rich guy (who apparetly will die of pollution rather than hunger). Dictatorships can provide only that. They cannot provide a sustainable ecosystem for long term growth. It is better to live in healthy atmosphere with half stomach. You just discount the eastern philosophy's power of fasting. Your view of poor and rich is very western which is purely in terms of dollars.But unfortunately it is not so. Did you know aurangazeb found happiness in being a poor hatseller rather than a rich emperor. A caged parrot fed on rich food is as poor as a parrot which is free but has to hunt for a small fruit. What is your view. Do you thing a guatanamo bay detainee is poor or rich. He get fed well but is imprisoned. Freedom is the soul of democrazy. Anon: "China today suffers from air pollution, contaminated food etc." Most major industrialized nations have experienced this during their rapid industrialization phases. London had a serious coal pollution problems and most of its buildings were covered with black soot. Los Angeles' air brought tears to people's eyes. But it all got fixed up as moved to control pollution. US FDA was set up only about 100 years in America's 250 year history. A Yale study last year found India's air to be the most toxic in the world. The world's worst industrial accidents like Bhopal have occurred in India. Anon: "Dictatorships can provide only that. They cannot provide a sustainable ecosystem for long term growth." There's plenty of evidence to the contrary. Just look at Singapore, Malaysia, Taiwan and South Korea all of which eradicated poverty and hunger, and brought education and prosperity to their people under dictators. Anon: "Freedom is the soul of democrazy." The most basic freedom is freedom from hunger and illiteracy. The financially beleaguered Pakistan Muslim League-Nawaz (PML-N) has claimed that the country has recorded at least five per cent growth in Gross Domestic Product (GDP) during the first quarter of this financial year and 17 per cent jump in revenue collection during July to November showing the “positive outcomes of the economic policies of the government”. During a press conference on Wednesday, Finance Minister Ishaq Dar said that the present government had successfully made a revenue collection of Rs 792 billion during the past five months against Rs 679 billion recorded in the same period last year – an increase of at least 17 percent. Besides, the fiscal deficit, which was recorded at Rs 690 billion during the period under the previous government, has been reduced to Rs 570 billion with the reduction of 2.2 percent. Remittances have also shown a growth of 7 percent during past five months making the figure to $6.4 billion against previously recorded $ 5.9 billion during the same period. Talking about foreign reserves which have depleted to over $3 billion, enough for only one month’s imports, the minister said that it was not a cause of concern for the government as it was expecting it. “The government has already stepped up efforts to jack up the reserves position to a reasonable level. We have policies and roadmap to bring the foreign exchange reserves to at least $20 billion in the next three years,” he said. Explaining how the depleted reserves figure would be pushed to the claimed level, Dar said that his government will receive $800 million from Etisalat by the end of the current month, with another $790 million from the Coalition Support Fund from US by January 15, 2014. Besides, at least $1.5 to 2 billion would be received against the auction of spectrum licence which is expected to be held in February 2014. Further, the government has received $137 million from the Islamic Development Bank. He said that inflation in the country was mainly because of the few bold steps taken by this government to resolve longstanding issues like circular debt. Through this move the government has saved at least Rs 70 billion in terms of interest. He criticised the caretaker government that despite changes made in 18th amendment of constitution, it had not cleared the accounts for the new government. Dar said that the devaluation of rupee was mainly because of speculation and government has taken steps to discourage speculators which was evident from the fact that the inter-bank rate on Wednesday was closed at Rs107 to a dollar. He hoped that the figure would further come down. According to him, the situation of inflows will further improve and those who speculate on Pakistani currency would end up as losers. The government, encouraged by positive outlook projected by “Standard and Poor” ‘Moodys’, planned to float a global rupee bond with the assistance of IFC who are also interested in floating of sovereign bonds of Pakistan which has received a very positive response from the market. KARACHI: Textile tycoons, government officials and financial analysts all converge on one point that the grant of European Union’s GSP Plus status to Pakistan is going to spark investment, create jobs and give a big boost to Pakistan’s economy in coming years. A long wait has come to an end as Pakistan has qualified for the generalised scheme of preferences, better known as GSP Plus, of the 28-nation European bloc. The EU parliament on Thursday approved the preferential status for all the countries that had applied for special concessions on duties. One of the biggest beneficiaries of the greater market access and duty concessions would be the textile industry of Pakistan that exported over $13 billion of products in the last fiscal year, constituting more than half of total exports worth $24.6 billion. “This is the biggest news for Pakistan’s economy in recent years,” Gul Ahmed Textile Mills Executive Director Ziad Bashir said, referring to the inclusion of Pakistan in the list of countries that won the GSP Plus status. Bashir, like other businessmen associated with the textile industry, has praised the government for effective lobbying and successful diplomacy. GSP Plus, which will come into effect from January 2014, would attract new investment in the textile sector, leading to hiring of more workers in coming years. “I think the GSP Plus will at least give a 10-15% boost to textile exports because of new investments in machinery, efficient energy systems, etc,” said Bashir. This positive news has not come as a big surprise. The government and private sector have been eagerly waiting for voting in the EU parliament, especially after Pakistan got majority vote in the EU’s International Trade Committee in the first week of November. Under the scheme, textile exporters can sell most of their products to EU states at concessionary rates of duty or without any duty, making the goods cheaper for European importers. Duty concessions will be for four years up to 2017. According to industry officials and initial details coming from Europe, the tariff lines covered under the GSP Plus are around 6,000, accounting for 91% of total tariff lines. It is expected that Pakistan will benefit from almost 2,500 tariff lines, of which around 900 are related to the textile sector, brokerage house Topline Securities said in a report. “We believe textile exports can be increased by at least $500 million to $1 billion in the next 15 months,” All Pakistan Textile Mills Association (Aptma) Central Chairman Yasin Siddik told The Express Tribune. Aptma is looking to create 300,000 to 400,000 new jobs in the next one year. The Asian Development Bank (ADB) on Tuesday announced restoration of Budgetary Support for Pakistan from March 2014 along with Three Years Business Plan for the country under which it would disburse $3.2 billion from 2014-16. ADB’s Country Director to Pakistan Dr Warner E Liepach made this announcement while addressing a press conference on Tuesday. The Bank announced its three years Business Plan for Pakistan under which it would disburse $3.2 billion from 2014-16. Of which about one-third will be for budget support while two-thirds for project lending. ADB has disbursed about $470 million in the current calendar year. Liepach further said that the Bank would disburse $2 billion to Pakistan during the current fiscal year. He said that economy is on track and the financial support for Pakistan has been scaled up. He said ADB supports the government reforms and vision 2025 and disbursement would be in recognition of its economic reforms. He said that currently about 25 projects for the country are in pipeline, which included those related to infrastructure, irrigation and energy. More than 20 projects are being funded by the Bank. Replying to a question, Liepach said that Diamer Bhasha Dam is still under consideration, however the Bank could not provide more than $1.5 billion for the project, which are linked with financial support and reforms. He further said that study report of the project would be completed in the next eight months. The ABD official said that there are operational and technical, governance and financial issues, including circular debt. The root cause of the circular debt needs to address while the cost should be brought down, he said, adding that the government has introduced some reforms; however these have been challenged in the Supreme Court. Regarding subsides by the government; the ADB country director said that they should be targeted. “The economy is kept up in the first quarter due to good power supply. There has been agreement with IMF for the privatisation of some units and the agreement should be honoured,” he stated. Liepach said that privatisation should be done with a formal planning. ADB, he said, has approved a loan of $167.2 million for eight distribution companies in Pakistan to improve the power distribution system and to help provide reliable, regular electricity to businesses and domestic consumers. The Bank has also approved $900 million loan for a new supercritical coal power generation unit in Pakistan that will deliver reliable, cost-effective electricity to hundreds of thousands of energy-starved households and businesses. The ADB has approved a $430 million equivalent loan to expand and strengthen national social safety net programme Benazir Income Support Programme (BISP), which is helping lift millions of families out of poverty, said Liepach. Pakistan’s central bank must “actively” work to increase foreign exchange reserves, including adjusting interest rates, the top International Monetary Fund official to the country said. “Pakistan needs to tap inflows including remittances, export revenue and capital transfers,” Pakistan mission head Jeffrey Franks said in a phone interview from Washington yesterday. Financial support from other international organizations likely to arrive in the next six to nine months will be “a positive,” he said. The IMF approved a $6.6 billion loan in September to help Prime Minister Nawaz Sharif’s government stabilize the economy, which has suffered from a Taliban insurgency and power shortages. While Pakistan’s performance in the first review was mostly satisfactory, the IMF said foreign exchange reserves fell to a “critically low” level. Sharif has changed energy policies to tackle power shortages and plans to raise as much as $1 billion in a bond issue abroad to raise funds. Currency reserves held by the State Bank of Pakistan have fallen about 60 percent to $3.7 billion on Jan. 2 from a year earlier, central bank data show. The central bank has raised the benchmark interest rate by 100 basis points since the loan’s approval to 10 percent. The IMF faulted authorities for failing to prioritize rebuilding reserves in the review released on Jan. 3 and said they will remain tight for the next two or three quarters. “The SBP must unhesitatingly use every policy tool at its disposal to boost reserves, including adjusting the policy rate, intervening to purchase reserves on the spot market, and allowing greater flexibility of the exchange rate,” it said. Pakistan’s rupee fell 7.7 percent against the dollar last year, among the worst performers in Asia, according to data compiled by Bloomberg. An earlier, partially disbursed $11.3 billion IMF program expired in September 2011 after Pakistan failed to meet the conditions attached to it. The head of Pakistan's central bank, Yaseen Anwar, resigned Thursday, the government said, on the eve of a review of the country's performance by the International Monetary Fund. "He has resigned for personal reasons," said Shafqat Jalil, a Finance Ministry spokesman. He didn't give any further explanation, and Mr. Anwar didn't return calls seeking comment. Mr. Jalil said an acting governor would be appointed Friday. Mr. Anwar had been governor of the State Bank of Pakistan since October 2011. His resignation comes as the economy faces soaring inflation and a sharply weaker currency. Foreign-exchange reserves are critically low. The country missed its target for foreign-currency reserves at the previous IMF quarterly review and was given a waiver on the issue. The IMF agreed to a $6.7 billion bailout in September, but has released only roughly $1.1 billion of the three-year loan. Officials from the central bank are to meet IMF representatives starting Saturday in Dubai, to begin the second quarterly review, a process that would involve the head of the central bank in the coming days. The IMF's quarterly reviews are designed to ensure the country meets its bailout conditions.If the IMF finds Pakistan is failing to meet its bailout targets, future tranches could be in jeopardy, which would put the economy further at risk. "The timing of this resignation is unprecedented, just before the second review," said a retired senior official. "It affects the credibility of the whole process." A focus of the review will be Pakistan's net foreign-exchange reserves. The volatility of the rupee has been a source of tension between the central bank and the government, analysts said. Mr. Anwar was widely criticized for his handling of the foreign-currency markets, an issue on which Finance Minister Ishaq Dar has personally intervened. Mr. Anwar, a former investment banker, was appointed by the previous government, of the Pakistan Peoples Party. The current administration, led by Prime Minister Nawaz Sharif took office in June. In recent years, heads of the State Bank have come under pressure to increase lending to successive governments, to finance their budgets, an issue that may have contributed to the departure of previous recent central bankers. "The Ministry of Finance does whatever it likes and the State Bank is expected to accommodate," said Zubair Khan, a former finance minister. Mr. Khan said Pakistan urgently required the IMF to increase the rate of disbursal of its loan. , saying the current program was based on "unjustified optimism." Pakistan is struggling with economic and security challenges. While Mr. Sharif's administration is considered business-friendly, analysts say its economic plans require an improvement in the security situation. Farrukh Khan, head of research of KASB, a brokerage based in Karachi, said that inflation was now steadying, while other indicators were also more positive. "The ship is turning around. It will take some time," said Mr. Khan. "There are definite signs of improvement." The IMF, after its first quarterly review, found Pakistan's performance "mostly satisfactory." It is forecasting GDP growth of 2.8% for the current financial year. However, the IMF had also found that "the balance of payments outlook has worsened and firm action is required to address critically low foreign-exchange reserves." Pakistan returned to the international bond markets Wednesday after a seven-year hiatus, joining a number of other countries around the world raising cash as yield-hungry investors look to put money to work. Pakistan sold $2 billion of debt, with almost two-thirds going to U.S.-based money managers, two days after Sri Lanka sold a bond for a second time this year. Bankers say Papua New Guinea, Bangladesh and Bhutan are also expected to come to the market this year, hoping to lock in low yields. The demand reflects both improving economies in these countries and investors' appetite to venture further afield for high returns. The appeal of emerging-market debt has risen as central banks in U.S., Europe and Japan pledge to maintain stimulus measures to keep growth humming, a move that pushes up asset prices across the globe. "There's been a reversal in the sentiment towards emerging markets over the last two weeks. Everyone loved to hate them, and now, all of sudden everyone is increasing their positions," said Rajeev DeMello, head of Asia fixed income at Schroders SDR.LN +0.38% Investment Management in Singapore, which has $435.4 billion of assets under management. Mr. DeMello's fund holds Pakistani bonds and said his funds are interested in buying more, and Sri Lankan bonds. In March emerging markets saw $39 billion in portfolio inflows from global investors—$24 billion of which was into bond markets—up from $25 billion in February and $5 billion in January, the Institute of International Finance estimated. Pakistan racked up orders worth $7 billion while Sri Lanka drew over eight times the $500 million on offer with orders of $4.3 billion, with a significant uptick of Asian investors' participation compared with its $1 billion January issuance. The finance ministries of Papua New Guinea, Bangladesh and Bhutan weren't immediately available for comment. Devesh Ashra, head of Asia debt syndicate at Bank of America Merrill Lynch, said the most important reason these countries are issuing bonds is the expectation that global interest rates are going to rise. The Federal Reserve has started slowing the pace of economic stimulus, meaning it is likely that yields are set to rise as the U.S. economy improves. "U.S. investors are looking for incremental yield and issuers are ready to lock in rates knowing that we are going to be in a higher-rate environment in one year's time," he said. The debt is sold in dollars, another lure for investors given strong prospects for the greenback in the long run on signs of a slow but renewed recovery. But even outside the U.S. dollar, there is demand for emerging markets that had been shunned last year. Turkey said Tuesday it would issue a euro-denominated bond and Greece says it will return to the market with an approximately €2 billion ($2.75 billion) debt sale, for the first time after being bailed out. While many other long-term investors remain convinced there is high-growth potential of these emerging markets, several are treading carefully and in some places demanding extra compensation for holding risky assets. Of the country’s total liquid reserves of $20.07 billion, $15.24 billion are held by the State Bank of Pakistan (SBP) while $4.83 billion are with the commercial banks. He said receipts under various heads have materialized, pushing the level of foreign exchange reserves to over $20 billion. These receipts include proceeds from Euro Bond, tranche from International Monetary Fund (IMF), Coalition Support Fund (CSF). Ishaq Dar said in February last year Pakistan’s foreign exchange reserves stood at $2.75 billion and at that time no one would have imagined that in a matter of such a small period of time these reserves would touch the present level.